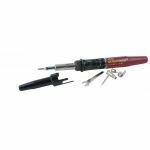 Master Ultratorch® UT-100Si Soldering Iron/Heat Tool. Professional quality, self-igniting, butane-powered soldering/heat tool. Standard with soldering tip, heat tip, spanner wrench, open end wrench, shrink attachment and protective cap.